The U.S. Branch Mint at Dahlonega, Georgia struck gold coins only, in each of twenty-four calendar years, although not all denominations were struck in each year. The denominations included half eagles ($5), three dollar pieces, quarter eagles ($2.50), and one dollar pieces. All Dahlonega coins are considered scarce, with some being very rare. They have their own peculiar characteristics of the minting process, such as weak strikes and imperfect planchets. Many possess a light green gold color due to their high silver content. It should be remembered that during all its years of production and for many years thereafter, there was absolutely no numismatic interest in saving Dahlonega Mint gold coins. Even the primary Philadelphia Mint did not save examples from this remote southern mint. All Dahlonega coins were put into the channels of commerce after striking. For decades there was a severe shortage of coin in circulation in the south and most coins circulated heavily. The survival of any Dahlonega gold piece is a matter of rare chance. And the survival of a high-grade coin such as a lovely AU (about uncirculated) coin is an even more important occasion. The largest mintage was that of the half eagle ($5), which were struck in all twenty-four calendar years of the mint's operation (1838-1861). In addition, several well known die varieties (the 1842-D large date, large letters, the 1846-D/D, and the 1848-D/D) are included in some complete sets of Dahlonega half eagles. Some collectors include additional die varieties in their half eagle sets. A total of 1,109,258 half eagle coins were struck. 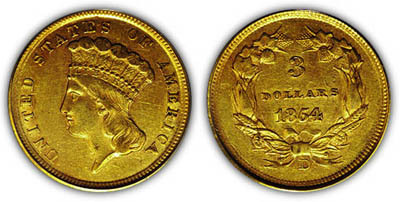 The elusive three dollar gold was minted only in the year of its introduction, 1854, and only 1,120 were struck. 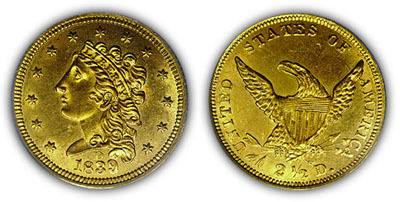 The second largest mintage was that of the quarter eagle ($ 2.5), which totaled 197,850 coins. 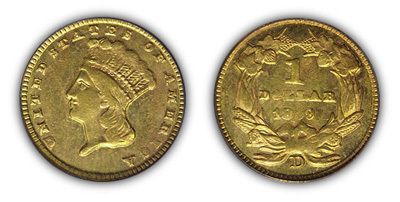 The quarter eagle was struck in twenty calendar years from 1839 to 1859; none were minted in 1858. 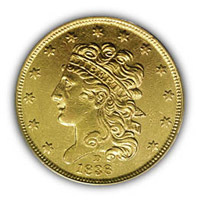 Gold dollars were minted in all thirteen calendar years from 1849 through 1861, with a total of 72,529 coins struck.